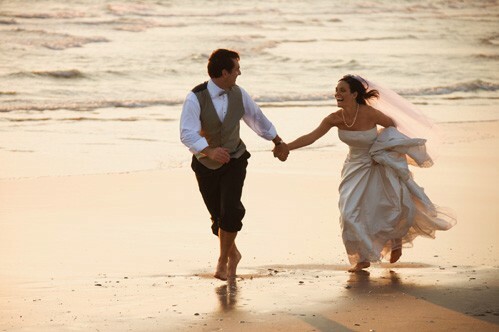 There's nothing more beautiful than having the Atlantic Ocean as your backdrop for a once in a lifetime beach wedding. The sand, the surf, the smell of salt air, and the call of seagulls overhead all come together to create the perfect setting for your special day. Why not go a step further and consider having Virginia Beach be your "Wedding Moon" - combining the wedding ceremony and honeymoon in one unforgettable vacation! It's a great way to bring the wedding party and guest together and afterwards the happy couple can enjoy a romantic destination for their special time together. It certainly would help save on expenses if you're on a budget. Siebert Realty - The Beach People. Over 400 Beach Home and Condo Rentals for weddings and honeymoons. Large wedding houses available that can sleep up to 30 people.